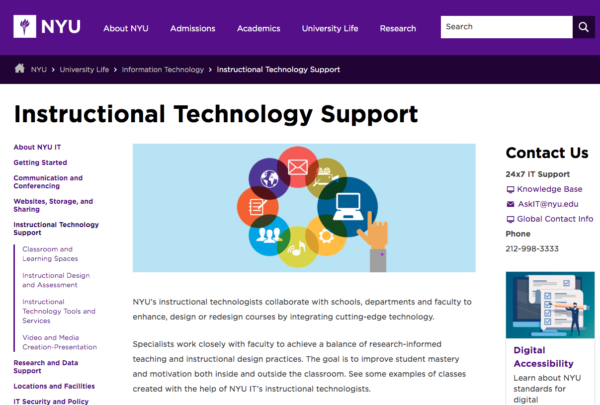 Faculty need a variety of instructional technology support—instructional design, content development, content hosting, training, and assessment—to name a few. They don’t want to go to one place for help, find out they’re in the wrong place, and be sent somewhere else—digitally or physically. Staff don’t want to provide help in silos, duplicate what other units are doing, be bogged down by flawed processes, or support conflicting or overly complex products or platforms. How can academic service providers collaborate to offer the right instructional technology support services, in the right place, at the right time, in the right way? Explore the factors that influence how instructional technology support services are offered in higher education. Answer critical questions about how your instructional technology support services should be delivered relative to broader trends and institutional goals. Experiment with ways to prototype new services and/or new ways of delivering them. Identify potential implementation obstacles and ways to address them. Why the Service Center Canvas? The Service Center Canvas was basis for an online course brightspot led for EDUCAUSE and walks institutions through the process of defining their vision, stating their organizational and service goals, describing the user and staff pain points, identifying the services offering and how they are delivered, and finally thinking through assessment, prototyping, and potential roadblocks. Let’s walk though this process step-by-step and illustrate how we used the Canvas to help a university achieve 88% satisfaction with instructional technology support and 78% satisfaction with instructional technology tools and platforms. What is the Service Center Canvas? To start with, if you’re not already familiar with service design, you might want to back up and read our EDUCAUSE Learning Initiative article 7 Things You Need to Know about Service Design to get a primer. A service is an interaction between a customer and a provider that creates value for the customer. This interaction forms a relationship that co-creates the service through different touchpoints over time—typically in five stages: entice, enter, engage, exit, and extend. Service design is the act of understanding, imagining, and assessing services so they are useful, usable, and desirable. Overall, the Canvas is organized in three sections: first, Context that establishes vision, goals, and pain points; second, Services that defines services offerings and how they are delivered; and Implementation that covers assessment, prototyping, and potential challenges. To navigate the Canvas, you’ll generally move left to right through these three steps, but of course expect to complete it in an iterative process as you move back and forth in conversations within your group—say the instructional design department—or across them. What’s in the Service Center Canvas? Let’s use a case study to walk through what’s in the Canvas and how you might fill it out. As background, a private research university sought a more unified approach to supporting instructors using technology in their courses. brightspot worked with the central information technology team, school representatives, the center for teaching and learning, the library, and the office of institutional assessment to understand the current state, develop a future vision, and create the service strategy. Our needs assessment revealed an impressive array of innovative teaching strategies, but also an awkwardly varied approach to collecting data, assessing results, and supplying instructional technology support–from instructional design to content development to technical support to course evaluation. Together, we updated portfolio of instructional technology services, established service levels, migrated to a shared ticketing system and knowledge base, standardized KPIs and an approach for collecting data, created new communications collateral, and facilitated a training program with tools and strategies for collaborative problem-solving. Vision: The vision should describe the ideal future staff of instructional technology and the people supporting it. Our favorite example is Bill Gates’s vision for Microsoft in the 90s: “A computer on every desk and in every home, running Microsoft Software.” In this case, the vision was “increase the adoption of active learning through technology,” which in hindsight is more like a goal. “Be the hub for instructional technology” might have been better. Organizational Goals: These were simple (but also really hard): Rationalize which services are provided by whom (i.e., central IT vs. school-based instructional designers) and meet increasing faculty demand efficiently. Service Goals: These more granular and service-specific goals were to create a common portfolio of services and common support platform (i.e., incident management and knowledge base), enable peer to peer learning among the faculty, and create a culture of continuous assessment and improvement among the staff. Pain Points and Needs: Based on our assessment through a survey, focus groups, interviews, and peer comparisons, we learned that awareness of services was limited, there was no shared metrics, data collection, or dashboard; and a lack of common language, common tools, and common goals inhibited staff collaboration. Services: For services, brightspot recommends you think through WHAT services you offer, WHO is offering them, WHERE they are offered, HOW they are offered, WHEN they are offered, and the metrics you’ll use to determined HOW WELL they are working. In this case study, we focused on five core services: instructional design, content development (such as creating a video module), content hosting through the LMS, professional development of staff, and feedback and assessment. In hindsight, we should have identified marketing and communications as its own service as it proved to be crucial for users and staff. Assessment: As we thought about what data we’d need, we determined that we’d need a baseline of usage and satisfaction data to enable future comparison. We also identified a staff capabilities assessment as crucial to inform future learning and development as well as recruitment activities. Challenges: To think ahead about what the implementation challenges might be and how we would address them, we identified physical separation of groups; limited faculty time to invest in redesigning a course, class, or assignment; and differences in technologies and language as key barriers. Prototyping: We thought a good place to start would be to create a shared digital front door that communicated the services, the different groups, and stories of how the different groups had helped faculty innovate in the past. After some wireframing, we quickly put this up and saw immediate results simply from being able to give everyone one place to go. To learn more about how prototyping can transform student services faster check out this blog post. In the end, we were able to achieve great results together. The university was able to provide 1,000 consultations within a year. We attained 88% faculty satisfaction with support services, 78% faculty satisfaction with tools and platform, and 80% staff satisfaction with training sessions. Once you download the Canvas, you might be wondering how to get started. Here are some suggestions. First, if you don’t have baseline qualitative and quantitative data on usage and user satisfaction, start there so you can use that to figure out where to focus your efforts. Second, use the Canvas to gently “force” collaboration, and keep in mind, as with many planning activities, the act of getting people together to discuss the questions and work on your Canvas is likely as valuable as the completed Canvas you’ll have as a result. Be sure to capitalize on this time to build (or repair) relationships and create momentum. Third, look for some quick wins that help you test ideas and build momentum—it could be a simple as a pop-up service point of “office hours” to meet faculty where they are. Remember that instructional technology services can be physical and/or digital so your “Service Center” can be about bringing together services in one digital place and/or in one physical place such as a Center for Teaching and Learning. In fact, one may lead to and complement the other since we live in a “phygital” world where most visits to a physical place begin online and people use mobile devices to navigate, discover, and connect while they are there. Good luck as you move ahead and please get in touch if you need a hand—we’d love to help you get results!